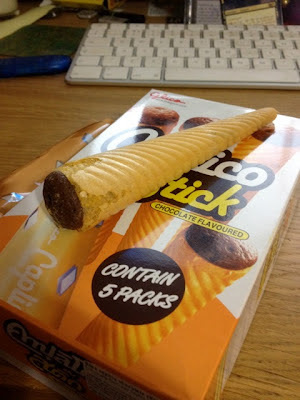 Previously on FoodStuffFinds I reviewed Giant Caplico Stick Strawberry and concluded that it wasn't actually as ridiculously sweet as I'd expected. These are the original versions, smaller and less ornate, but still pretty exciting non-the-less. A pack contained 5 so upon purchase I distributed these amongst the junior reviewers and left the box on my desk. Unlike the giant version I wasn't too intimidated to eat one of these as a summer evening snack post dinner (pie) and didn't really have to think much about making a mess with all the fragments as it was easy to bite in sections. I was sure I'd prefer the strawberry flavour - after all this is Glico Pocky fondant we are considering and not actual chocolate - but the brown stuff is pretty satisfying. It has a plain chocolate kind of taste and the sweetness of the wafer cone offsets this nicely. It's not refreshing, which is disappointing due to its summertime shape, but it is quite a light snack. I'd certainly consider these again just as an 'eat' and not as an experience. The other flavours will taste similar to their respective Pocky brethren and the gimmick isn't enough to full me with the desire to show everyone. A good solid novelty snack, and after hordes of terrible novelties that's not a bad mark to aim for. I read this as chocolate calipo which I'm sure would be entirely disgusting!